Facebook recently announced that it is rolling out new, more detailed insights for business pages. The new layout should greatly assist us in our analyses of what is or is not working on our pages. For starters, the “People Talking About This” (PTAT) metric will be broken down into more specific readings. The number used to reflect a generic whole in a more overview fashion. We will now be able to see details, including how many people liked our pages, the number who clicked on and/or liked particular posts and who commented and/or shared them. Also, page interactions such as mentions, check-ins and tags will be noted in the new Insights. The “Virality” metric has been changed to “engagement rate” in the new version of Insights. This moniker reflects Facebook’s move to include post clicks in the measurement. Surprisingly, they were not factored in previously, even though the virality metric was considered a reading of overall quality of page posts. Another very useful improvement in Facebook’s new Insights is the more comprehensive level of per-post analytics. Each one will now feature a score card type of layout, obtainable when we click on the name of a post we wish to examine more closely. The number of people reached will be listed, as well as the exact numbers of likes, comments and shares. Precise numbers of views and link clicks will also be enumerated. Additionally, negative activity will be included in the new Insight metrics. We will now see how many times specific posts were hidden, reported as spam, or even resulted in page unlikes. These improvements will allow us to determine better than ever before which of our posts generate the most positive activity. Armed with this knowledge we will be able to produce more of a similar type to grow our followings and engagement. The final change – for now – to Facebook’s page Insights has to do with the demographics metric. It currently breaks down by gender, age and geographic location who among the population we reached with our posts. With the update we will also get to see who among all those folks we have engaged with those posts. What a wonderful way to see which types of content resonate with what segments of the population, so we may be better able to target our messages! 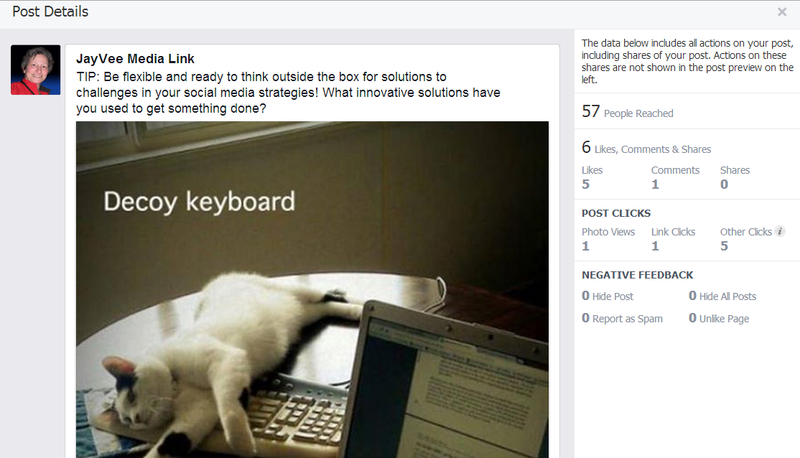 Are you looking forward to using the new Facebook Page Insights? Which part of the new metrics do you feel will benefit you the most? Please share your thoughts in the comments section below! This entry was posted in Facebook, Facebook Page Insights, Social Media Management/Marketing and tagged engagement, Facebook, Facebook Page Insights, Jeanine, people talking about this, reach, Social Media Management/Marketing, Vecchiarelli by Jeanine Vecchiarelli. Bookmark the permalink.